Iscariah (real name Stian Smorholm) is probably most famous for his stint with Norwegian legends Immortal, but the man is a member of many other interesting bands, and is also the head of the ebbing and flowing music label Edged Circle Productions. Since Iscariah plays bass for them, there is little surprise Edged Circle Productions is the venue that Infernal Manes chose to resurrect their underground career. Composed of other notable black metal players (Laegreid brothers from Dead to this World, Deathcult), Infernal Manes have zero to do with black metal, but rather explore heavy metal’s deep hidden 70s roots. Through setting sun, cinematic dreamscape and sounds of battle energetic NWOBHM emerges on Symphony of War. Rough, no polish production reveals muddy riffs, great solos, and the voice of the vocalist TJ Cobra (no longer with the band) leading the way. Infernal Manes, the song, and the opening of Mind Destructor was what we used to play air guitar to in my teenage years. 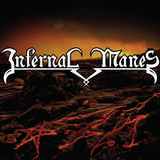 Infernal Manes is proverbial 70s Judas Priest “riding on the wind” and Iron Maiden gallops. Thin the sound of Infernal Manes may be, but this is no frills, pure historical reference to where metal came from. Battle of Souls may be more muscular and jagged edged, with soothing harmonies hidden in the middle section, but Infernal Manes do not intend to overpower you. The band also clearly displays an inclination or hint towards the occult, acoustic portion of Mind Destructor, along with the whispers and spoken vocals, creating plenty of mystery and reminding me of Attic. TJ Cobra’s voice is all things together boyish, naïve and animated. He can do high falsetto and will do very well trying to impersonate young Rob Halford. That comparison notwithstanding, but also given how chugging of The True Force of Power retold the story of Stained Class and Invader, one would expect Infernal Manes may cover early Judas Priest, so at first a nod to Mercyful Fate in the form of Come to the Sabbath from the legendary Don’t Break the Oath may seem strange, but not after you listen to the album original songs for a few more times to discover that Infernal Manes ooze psychedelia all over the place. This cover, in a sense, makes everything connect full circle and drafts a future path for Infernal Manes where proto-heavy metal and mysticism meet on the same plane. The band is said to be at work on the full-length new album.